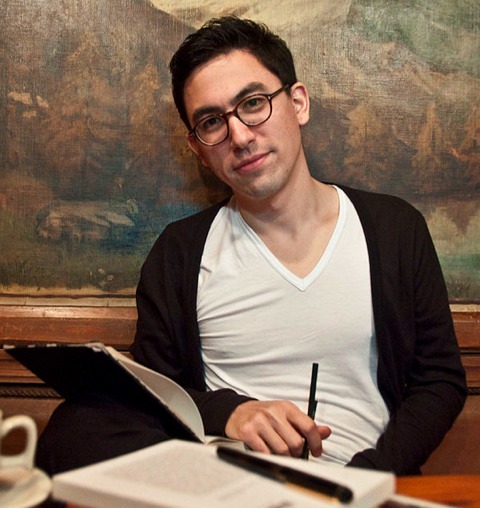 José María Ken Niimura del Barrio is a citizen of today’s truly international, transnational comics world. 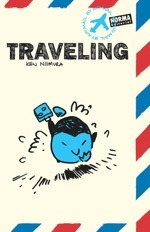 Born in Madrid in 1981, he’s lived and worked in Brussels, Paris, Montreal and Madrid under the pen-name Ken Niimura. Three years ago he moved to Tokyo. 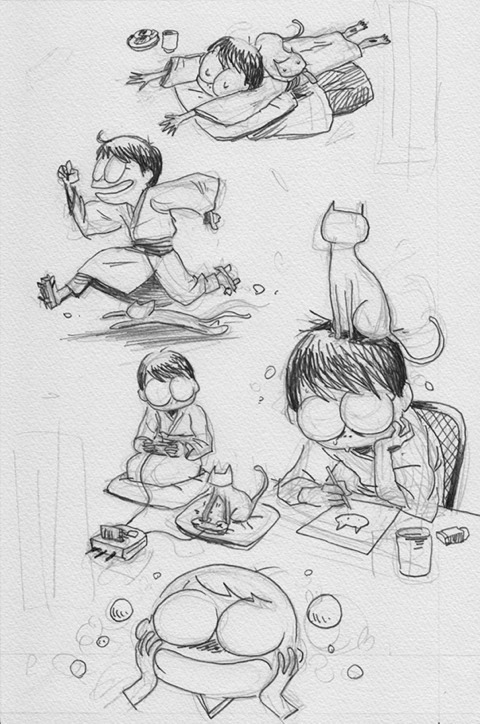 I first met him when I helped select him to come to London for Comica Festival in 2007 as part of the innovative Asia-Europe Foundation’s cultural exchange project through comics called Lingua Comica. 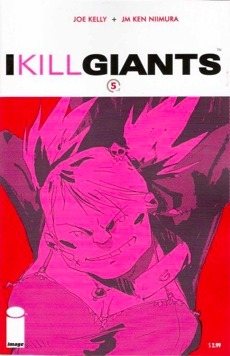 The following year saw the start of his seven-issue mini-series for Image Comics, I Kill Giants, by American writer Joe Kelly (covers above). 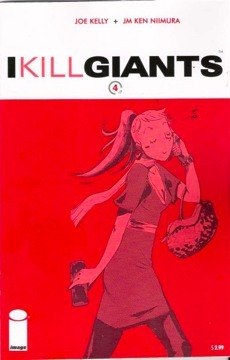 Collected in 2009, it went on to be nominated for an Eisner Award and to win the top prize, the Gold Medal, in 2011 in the Japanese Foreign Affairs Ministry’s Fifth International Manga Awards. With that kind of recognition, a Japanese translation followed (below). 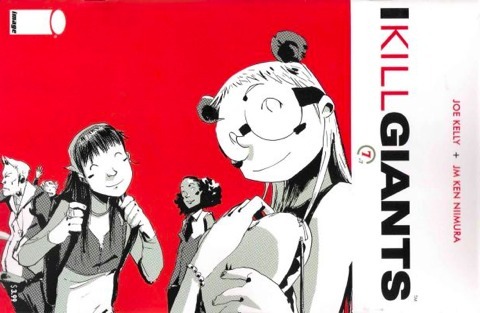 In 2013, I Kill Giants came second in the Gaiman Award. 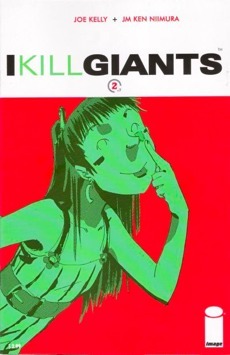 Despite the name, this has nothing to do with Neil Gaiman, but derives from the word “gaiman”, an abbreviation of gaikook no manga or ‘foreign manga’. This award was started in 2011 to increase the profile in Japan of American comics, French bande dessinée and other global forms of comics. The award is sponsored by Kyoto International Manga Museum, Kitakyushu Manga Museum and Meiji University’s Yonezawa Memorial Library of Manga and Subculture. 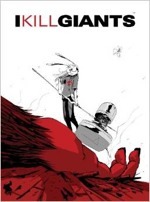 The Hollywood Reporter announced March 23rd that I Kill Giants is being adapted by Oscar winner Anders Walters with Chris Columbus acting as producer. 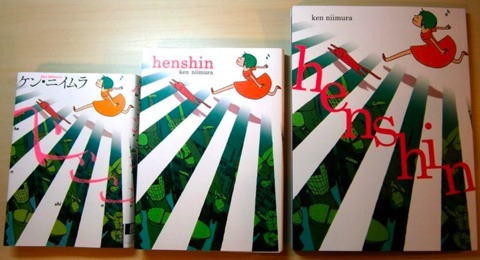 His latest book is the utterly charming and moving collection of thirteen short stories entitled Henshin, published first in Japan, then in Spain and most recently in English, once more from Image Comics (all three editions below). 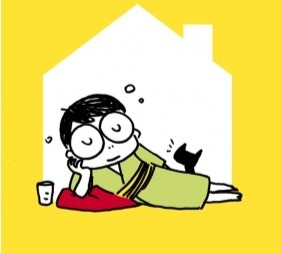 I caught up with Niimura again to find out how his manga and his life are going in Tokyo. Who inspired you most as you were growing up and right now - and why? And not necessarily just in comics! Two names, one is Hayao Miyazaki. He has been somebody I enjoyed as a kid, and even now I like him. Because I’ve known his movies since the age of 5, I have been enjoying them in so many ways. It’s incredibly interesting to watch them right now. As a creator, I find it fascinating that he is able to make very personal stories, and yet make them interesting for people to see. For a very mainstream author, he is very personal and peculiar. The other name lately is German filmmaker, Werner Herzog. I discovered his movies about seven years ago. I like how hypnotising and deep his movies are and how little they care about rules of storytelling. You are hooked from the moment you start watching them. He is an author but again he makes movies for a big audience. Though Miyazaki and Herzog come from different fields, I appreciate people who remain very personal but in a way that they can be understood by a wide public. It’s difficult, but honest and beautiful to see someone who tries to be understood. I like very arty movies or comics, but sometimes they lack a certain will be to understood. I understand that position, but I see myself in that group that tell their own stories but make their effort to be understood. I’m especially interested in your experience of ‘breaking in’ to the professional manga system in Japan. Did you enter competitions? How was this process for you? 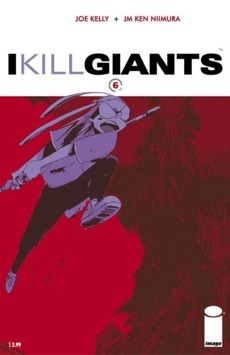 I started doing comics in Japan thanks to my American graphic novel I Kill Giants with Joe Kelly (splash page, above). 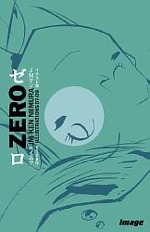 It won the Gold Medal in the International Manga Award in 2011. I showed it to a couple of publishers here, one of them was Monthly Ikki magazine. 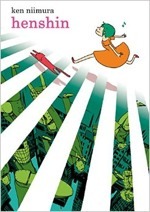 That was thanks to Taiyo Matsumoto, who I met in Spain 5 or 6 years ago. He has been one of my idols in comics for some time. I was happy and honoured to meet him and even more that he appreciated my work and introduced me to the publisher of Ikki, which is a magazine that I’ve loved since I first saw it. It’s nice knowing they like what I do, and become part of their family in a way. They had seen what I could do, so that’s how I started working directly on Henshin. So no contests or short stories first. How did you develop your short story series Henshin? The editor I worked with is Yumetaro Toyoda, and the editor-in-chief of Ikki is Hideki Egami. We started talking about a project, and it ended up being a one-year pre-publication on their website. They saved that slot for me and we came up with the concept for Henshin. So I had a short cut to enter the market. If we spoke in culinary terms, Henshin would be like fresh market cuisine, cooking with what’s available according to the season. The challenge lies in finding as many different flavours as possible with a limited number of ingredients. The project was a huge challenge for me, since they’re the longest stories, between 12 and 26 pages, I’ve ever written. What I really like about short stories is that you can try different genres each time. I felt very fortunate to be able to experiment. 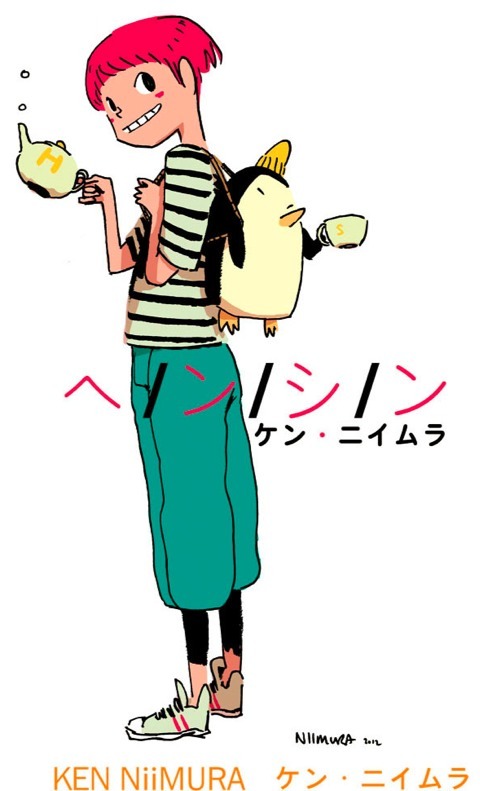 A new chapter of Henshin appeared every third Friday of each month, starting from January 18th. Henshin means ‘transformation’ or ‘reply’ depending on the context. For example, the characters in Power Rangers say “henshin” when they transform. I have read and enjoyed Bakuman by Tsugumi Ohba and Takeshi Obata (in English from Viz), which gives a fantasised version of how to ‘make it’ in boys’ manga. How does it compare to the real thing? My direct experience is not in mainstream manga. Although the basics for Bakuman are embellished and made exciting, what I like about the series is the idea that there is a specific career path for authors in Japan, that you don’t find elsewhere. Here you enter a competition, or publish a zine, and if you get selected once or several times, you get an editor who works with you. From there you work with the editor on short stories to get to know your publisher and for you to develop your way of storytelling and discover new things. The next usual step would be a serialisation in a magazine. It’s a peculiar, pre-determined path, which is also reassuring for newcomers, because you know what your next step is, these steps allow the author to grow. For me working in Spain or elsewhere, I didn’t know what my next logical step should be. In Japan you always know where you are and where you should be going next. It’s why Japan has such a huge amount of authors, they are able to train like a pupil to become authors. What do you feel about the option of working first as an assistant? I have rarely seen this elsewhere than in Japan. For me, if I had had that option in university, it would have been incredible, but I have never worked as an assistant. You do the tasks they tell you, you are working, but you get to know how professional authors works. It gives you perspective, tools and reassurance for when you start working on your own. I would have been happy to work with a pro author, to learn things through him. At certain moments, it can be really useful. Is there camaraderie among young upcoming mangaka like you? Is there a social scene among your comics-making friends? 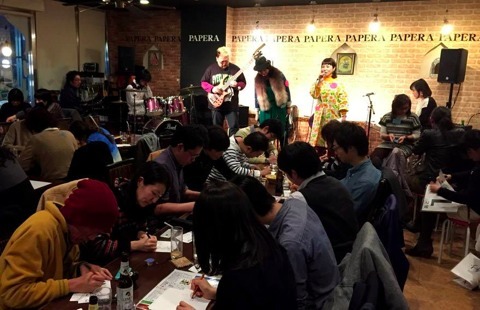 Meet-ups and ‘drink-and-draws’ jam sessions? Maybe karaoke?! For most of the young authors living in Tokyo in today’s market, most of their work is done through meetings working face to face. So being in Tokyo makes sense. But there is not such a tight scene here, there are many mangakas but they are quite isolated. They have deadlines for many different magazines, so you never get a specific day when you are both free. Tokyo is a very big city, you have to plan ahead so it is more difficult to get together. Many mangakas are very introverted people, so they do not meet up so much, and editors are not so interested in authors meeting each other, they want authors to work. I do have friends, but we meet in smaller groups. That’s not the way I am used to interacting with other artists. So I have been organising Drink and Draw sessions once a month, where you can meet people while drawing. S/S/K is a drawing event we’ve been organising in a bar in Shibuya for the last 2 years, where we try to squeeze our brains and creativity through small challenges like exquisite corpses and others. We’ve called it S/S/K as a short version of the Japanese word sousakukai, meaning creative meeting. We organised a special edition with a live band, to which we invited people that hadn’t come before to these sessions (photo above). It was a huge success – there were lots of incredible drawings, and above all the pleasure of sharing some quality time among friends. If all goes well, we’ll do another one soon. There aren’t that many private gatherings of mangakas here, nothing like what you have in the U.S. or Europe. Tokyo is a weird place. I got the chance to go out with Katsuhiro Otomo and Katsuya Terada for karaoke, one of those random weird situations you’d never expect which can somehow magically happen. Do you personally work alone or share a studio? I’ve been working on my own at home here for the first three years, but now I work with another mangaka, Takeshi Miyazawa, a Japanese-Canadian who worked for Marvel and is now based here, and with a writer in a studio we rent. It’s a way I am used to working elsewhere. This might be private, but do you make enough money from manga to do them full-time or do you have other revenue streams too? 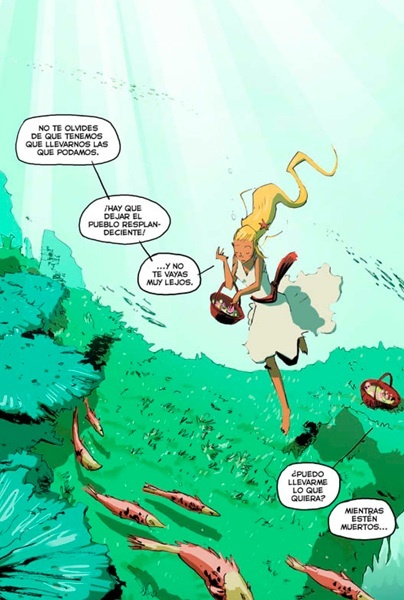 I do work full-time doing comics, my income comes from both the page rate and foreign editions, and I do a bit of illustration and teaching on the side. I make my living doing comics and I use my savings to make my other comics. I do not have fixed income every month, but overall I live by comics and do them all day. 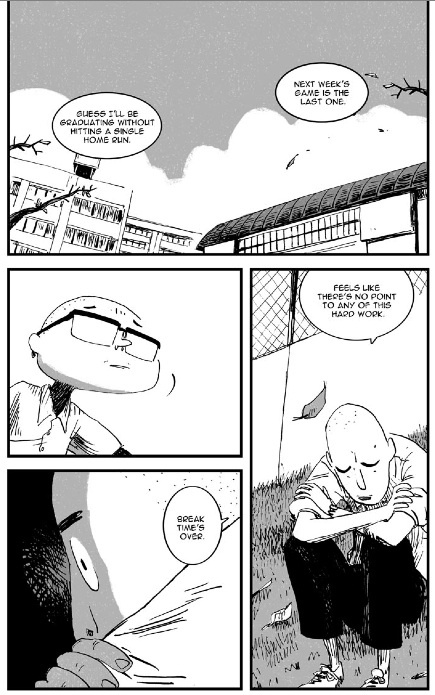 What inspires you to write your short stories in Henshin and elsewhere, and how do you find writing your own comics? Are short one-shots one of the stages a developing mangaka goes through to prove him/herself to the editor and test reader reactions? 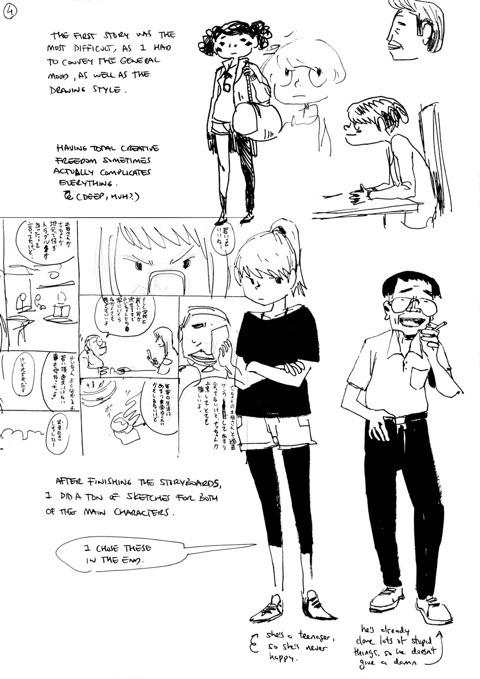 Yes, doing short stories is a stage every mangaka goes through. It allowed me to work for a whole year on short stories [you can download a sample story about a baseball friendship ‘Victory Sign’ here…, page below]. There’s nothing like working on something constantly, it forced me to try new things. That process makes sense. The basic concept behind Henshin is taking things I saw in my daily life - in cooking terms, these are the ingredients - and then looking for interesting ways to put them together and cook dishes with them. I come from a drawing background, so writing is not my speciality. It took some time for my stories to find their right tone. I learnt a lot, it is a very different experience from working with a writer. Telling my own stories is not the only thing I want to do, I still want to work with other writers, but it’s good to be able to use my own ideas. What is your relationship like with your editor? What are the pros and cons of this close relationship? I have a good relationship with Toyoda-san, my former editor. Working on short stories is necessary for authors and editors to build a good working relationship. You have to get to know each other, how the other person thinks, and create a trustworthy relationship, to trust their judgement and share certain common points. When it comes to deadlines though, there is no friendship whatsoever, work is work! I didn’t always agree with some of the changes he suggested. It is not always easy, but that is normal, you are never going to agree 100%. So far I have been lucky. 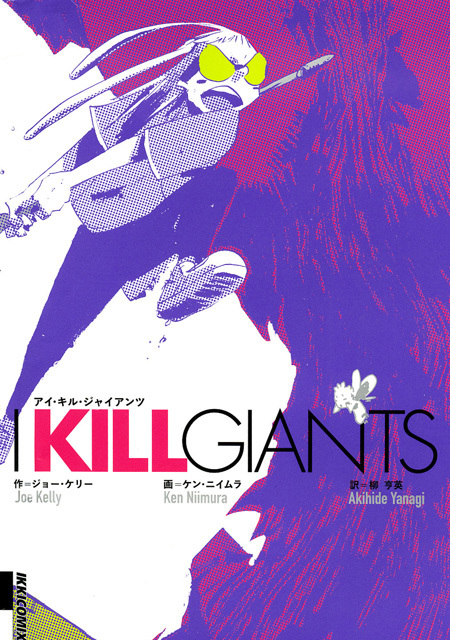 Is your ambition to work on a longer serialised story of your own for Shogakukan? What sort of a project like to this do you have in development? Yes, I am working on one new project and I cannot tell you for which publisher, it has not even been approved. It will be for somebody else than Ikki, as that magazine no longer exists. If Henshin was having lunch at a tapas bar with lots of small dishes, the idea for my new project is taking the recipes and elements and cooking a whole full lunch course. It’s something in the continuity of Henshin but a longer story, 200 to 300 pages. It gets really deep for me as a complete author and creator. How much pressure is there to conform to the stories and styles that have proven popular already? Are you at the mercy of the readers’ polls? Ikki was an experimental monthly from Shogakukan by mainstream standards - did you particularly aim your work at this title? What appealed to you about it? I have not been reading Ikki itself, but I have been following from the beginning years ago. It has published so many incredible authors like Matsumoto and Daisuke Igarashi, who make very personal stories but readable and understandable. On Ikki and some other similar magazines, the authors have lots of points in common with other independent creators in the U.S. and Europe, which you might not find in the mainstream. 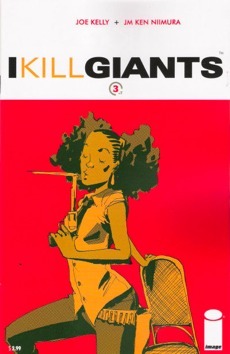 Once you go more into this indie scene, it looks like many people all over the world think similarly. If there was any magazine I would fit with, it was Ikki. 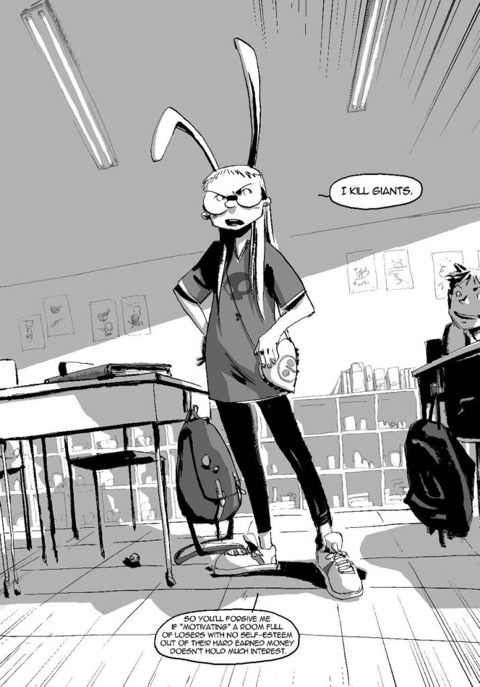 When I did I Kill Giants, I asked Joe Kelly about doing it in black-and-white and divided into chapters, because I wanted to approach it like manga. I was daydreaming wouldn’t it be great to be published by Ikki. And that dream came true. Weird but it makes sense somehow. I gather Ikki has ended now - what’s the story about this? When and why did it happen? I don’t really know all the details, the last issue was the October edition last year (cover by Matsumoto, above). The reason was simple - sales. A magazine association puts out sales for every magazine including manga and Ikki had the smallest print run in the whole manga industry. Overall, manga magazine sales have been shrinking for the last ten years, so those that are suffering are those with the lowest print runs. Many magazines with similar print runs have been closing down in the last few years. The result is that the market here is getting more polarised. Your options are either doing very mainstream manga aimed at a very specific market or if you want to do more indie stuff, do it on the web or in small print0run magazines. There used to be this middle ground, a very interesting part, that is disappearing little by little. 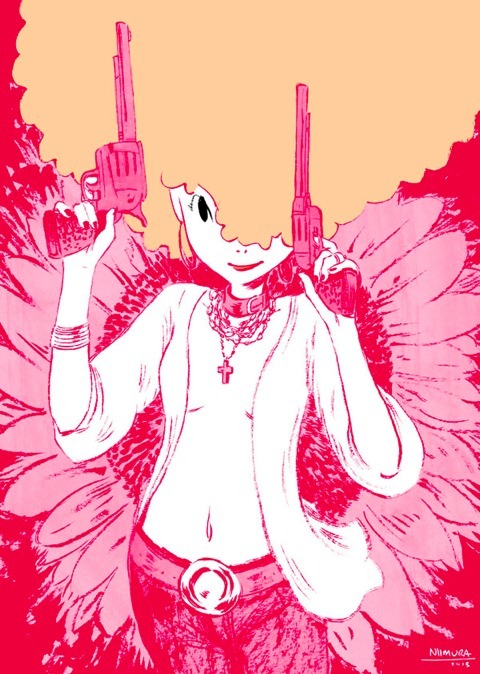 I heard that Taiyo Matsumoto’s Sunny will continue now directly into books? How have other series and their creators coped with serialisation in Ikki magazine ending? Certain series like Sunny have been transferred to Monthly Spirits magazine. Others close to their finish have been transferred to other magazines or other publishers. For others which have 100 pages or so to go, Ikki has commissioned the last book as an original work, published directly in book form. Then there are others like me who published a book and now I am looking for other places to publish. There a fewer slots, so more competition. Any plans for another collection like Henshin in Japanese? Have you self-published doujinshi or small-press zines there? How is that regarded by other pro mangakas or your editor? Last year I put out a collection in Spain called Travelling from Norma Editorial which included short stories I have done in lots of different places (above). I don’t see that book happening here in Japan. Maybe other short stories I have in the works. Every so often I do publish mini-comics and stuff, that I sell at fairs. In the mainstream world, this is difficult as authors are too busy, but outside of that world you can set up your own booth at fairs and sell directly to the public. Editors and publishers are fine about this and it’s good to try these, because there’s no pressure. There are some cases of authors who have self-published who finally get published by professionals. 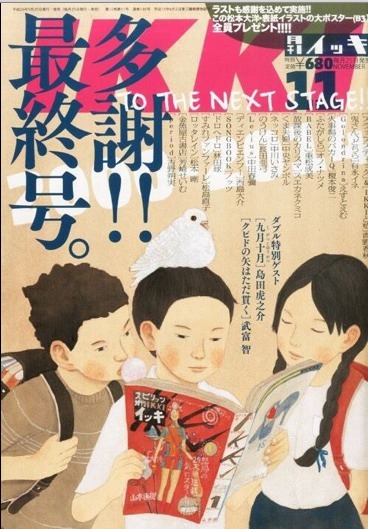 It is another possible path for young authors. I recall reading a wonderful interview with Ikki‘s editor Hideki Egami, who said ‘We are still at the dawn of the age of manga!’. So inspiring to hear his vision. Do you think there is still room in manga today for an authorial vision and for strong individuality, even eccentricity? Is manga still evolving? Yes, there are lots of really interesting manga happening on the web, at conventions, in zines that I buy. There are tons of incredibly talented authors who in ten, fifteen, twenty years’ time will become big. Although many magazines are disappearing, the market is still very big and there is room for weird things to happen. It’s really inspiring to see that. Tell me about your other Japanese and Asian comics projects - you sent me an exhibition catalogue you were part of from Korea, right? Have you been there, if so what do you think of the manhwa culture and market there? I didn’t get to go to Korea in the end, however I have seen Korean comics. I don’t know if they represent what is out there, but I find them incredible, the graphic part. The editions they put out, they are beautiful books. I look forward to reading more when they are translated. Of all of the Asian comics I have seen, Korea is where I have seen most interesting and cool things. Also in Thai comics. Other markets like China and Taiwan are heavily influenced by manga, there is incredible quality, but they are less shocking. Korean comics are more surprising to me. Where do you see yourself in the future - more centred in Japan, or keeping options open to work in the U.S. and Europe/Spain as well? Do you want to create comics that can work in all three markets? My ideal career would be working alone or with others for any market, and on works that could work in any context. 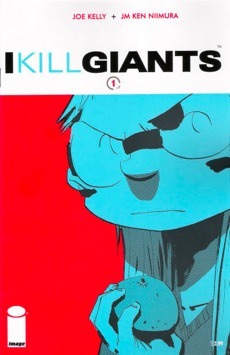 Basically, what I did with I Kill Giants and Henshin. 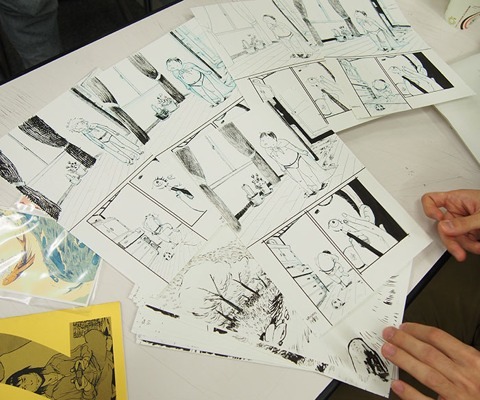 I will keep on working in Japan, more than thinking, ‘Shall I put this comic in Japan or elsewhere?’ I can develop my own way of telling stories, which I hope will be understood in as many places as possible. I hope I can keep as much freedom as I have now, that would be fun. It sounds a bit selfish, it’s like going to a sweet shop and wanting to buy all the sweets!